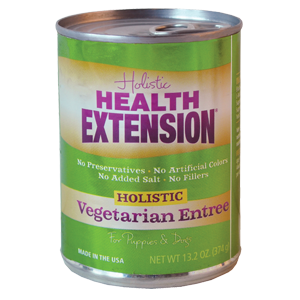 Health Extension Vegetarian Entrée Canned Dog Food provides a wholesome, complete, and balanced maintenance diet for your dog with no meat or animal proteins. Specially formulated for dogs with food sensitivities. Our Health Extension Lamb Entree is an excellent source of high quality protein, made with real New Zealand lamb. There are no growth hormones or steroids. Lamb is a nice option for dogs that need a high quality protein but have allergies to other commonly used protein sources. Dogs that prefer canned food will benefit from all the real-food ingredients. 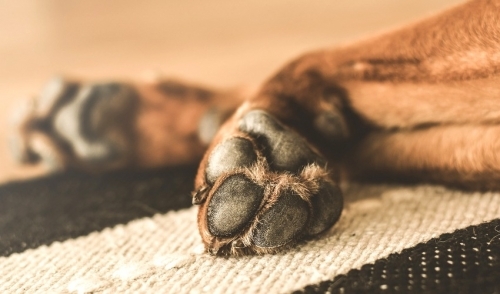 The best way to add protein to your dog’s diet! Our Meaty Mix Chicken contains over 98% all-natural, super premium deboned chicken. Add to your dog’s favorite dry food and stand aside. Try both Meaty Mix formulas today! Our 100% Grain-Free Health Extension Duck Entree is an excellent source of high quality protein, made with all-Natural Duck. 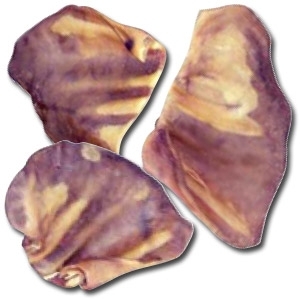 The sweet potatoes add an excellent source of vitamins, minerals and beta-carotene. Dogs will enjoy and benefit from our deboned duck entree free from growth hormones, steroids, meat by-products and allergy related fillers. 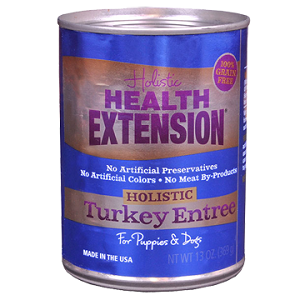 Our Health Extension Turkey Entree is an excellent source of high quality protein, made with real Turkey and Chicken. There are no growth hormones or steroids. The sweet potatoes and carrots add an excellent source of vitamins, minerals and beta-carotene and blueberries are high in antioxidants. Dogs that prefer canned food will benefit from all the real-food ingredients. The best way to add protein to your dog’s diet ~ Our Meaty Mix Beef contains over 95% all-natural, super premium real Beef. Add to your dog’s favorite dry food and stand aside. Try both Meaty Mix formulas today! Health Extension’s new 95% Salmon canned wet dog food is the perfectly formulated way to add more protein to your dog’s diet. All natural, American made and 100% Grain Free! Our 100% Grain-Free Health Extension Chicken and Vegetable Stew in Gravy is an excellent source of high quality protein, made with all-Natural chicken. 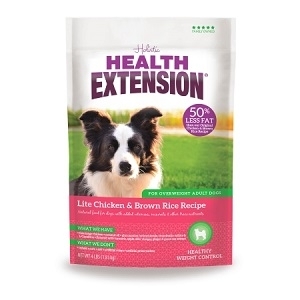 This Health Extension dog food formula provides an excellent source of vitamins, minerals. Your pup will enjoy and benefit from our Grain Free stew due to its lack of growth hormones, steroids, meat by-products and allergy related fillers. Our 100% Grain-Free Health Extension Beef and Vegetable Stew for dogs is an excellent source of high quality protein, made with all-Natural beef. Our formula provides an excellent source of vitamins, minerals. 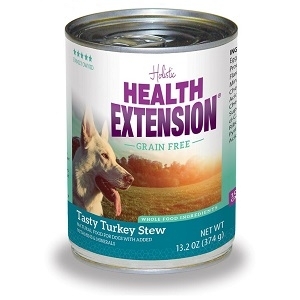 Dogs will enjoy and benefit from our Grain Free stew due to its lack of growth hormones, steroids, meat by-products and allergy related fillers. All of the same, great taste and nutrition as our original chicken and brown rice recipe but in bigger bites for bigger dogs! 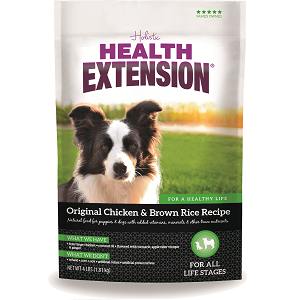 Health Extension chicken and brown rice large bites formula offers your pet the ultimate completely balanced diet containing highly digestible meat proteins. Our unique blend of nutritional supplements separates Health Extension from other super premium dog foods. Offering your pet this superior blend will proactively provide your dog the benefits of a healthier life. 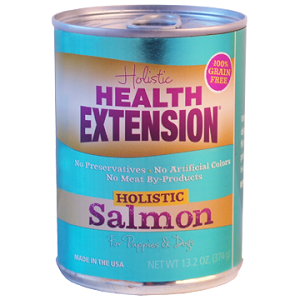 Offers all the health benefits of the Holistic Health Extension System in a grain-free formula. And you won’t find any added hormones – just high quality, deboned duck as our FIRST ingredient – because we believe sensible protein levels are the first step to a healthy life. With such a pure formula, Grain Free Duck & Chickpea is especially beneficial for dogs with allergies to poultry or sensitive digestive tracts. Unlike other brands, our grain-free variety contains a unique blend of nutrients and supplements, like organic apple cider vinegar and colostrum to boost immune systems for improved health. 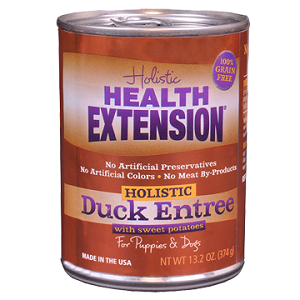 Deboned duck and duck meal are an excellent source of highly digestible later native proteins. Duck contains high levels of essential amino acids. 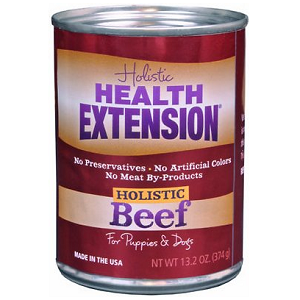 Offers all the health benefits of the Holistic Health Extension System in a grain-free formula. And you won’t find any added hormones – just high quality, deboned salmon as our FIRST ingredient – because we believe sensible protein levels are the first step to a healthy life. With such a pure formula, Grain Free Salmon, Herring & Chickpea is especially beneficial for dogs with allergies to poultry or sensitive digestive tracts. Unlike other brands, our grain-free variety contains a unique blend of nutrients and supplements, like organic apple cider vinegar and colostrum to boost immune systems for improved health. 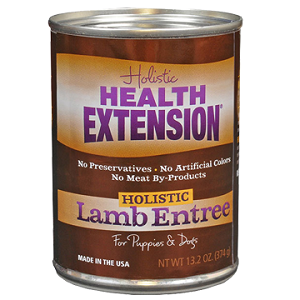 Offers all the health benefits of the Holistic Health Extension System in a grain-free formula. And you won’t find any added hormones – just high quality, deboned venison as our FIRST ingredient – because we believe sensible protein levels are the first step to a healthy life. 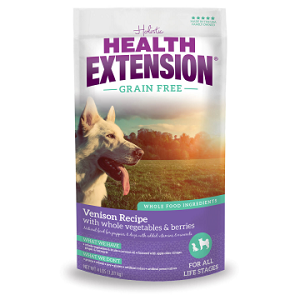 With such a pure formula, Grain Free Venison and Chickpea is especially beneficial for dogs with allergies to poultry or sensitive digestive tracts. Unlike other brands, our grain-free variety contains a unique blend of nutrients and supplements, like organic apple cider vinegar and colostrum to boost immune systems for improved health. Our most popular Grain Free dry dog food formula is now available in little bites! 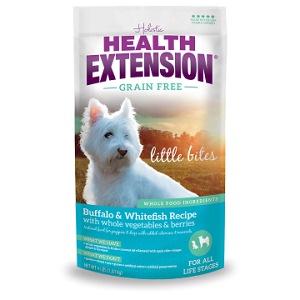 Health Extension’s Grain Free Buffalo Whitefish and Chickpea Little Bites, offer all the health benefits of the Holistic Health Extension System but in a grain-free formula. And you won’t find any added hormones – just high quality, deboned buffalo as our FIRST ingredient – because we believe sensible protein levels are the first step to a healthy life. 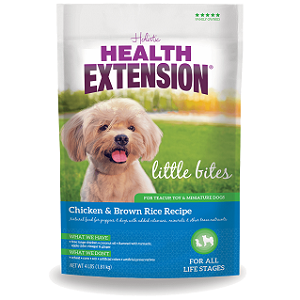 With such a pure formula, Holistic Health Extension Grain Free Buffalo, Whitefish and Chickpea Little Bites are especially beneficial for puppies or toy breeds with allergies to poultry or sensitive digestive tracts. Unlike other brands, our grain-free variety contains a unique blend of nutrients and supplements, like organic apple cider vinegar and colostrum which may help boost immune systems for improved health. Health Extension’s Grain Free Buffalo, Whitefish and Chickpea, offers all the health benefits of the Holistic Health Extension System but in a grain-free formula. And you won’t find any added hormones – just high quality, deboned buffalo as our FIRST ingredient – because we believe sensible protein levels are the first step to a healthy life. 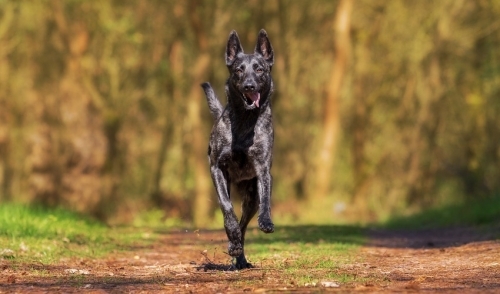 With such a pure formula, Grain Free Buffalo, Whitefish and Chickpea is especially beneficial for dogs with allergies to poultry or sensitive digestive tracts. Unlike other brands, our grain-free variety contains a unique blend of nutrients and supplements, like apple cider vinegar and colostrum which may help boost immune systems for improved health. Health Extension’s Grain Free Chicken & Turkey recipe offers all the health benefits of Health Extension’s Original recipe but in a grain-free formula. And you won’t find any added hormones ‘ just high quality, organic chicken as our FIRST ingredient ‘ because we believe sensible protein levels are the first step to a healthy life. With such a pure formula, Grain Free is especially beneficial for dogs with allergies or sensitive digestive tracts. Unlike other brands, our grain-free variety contains a unique blend of nutrients and supplements, like apple cider vinegar and colostrum to boost immune systems for improved health. 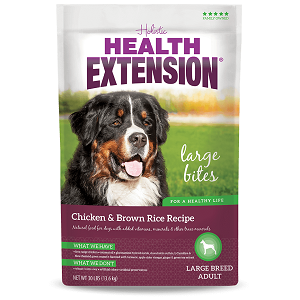 Vets Choice Holistic Health Extension Lite has been nutritionally formulated to meet the needs of overweight, spayed, neutered and senior dogs. This tasty reduced fat formula contains 50% less fat than our original variety. Immediate benefits of this food will result in an overall healthier pet with a stronger immune system, more efficient digestive system, healthy skin & coat as well as stronger bones and teeth. Holistic Health Extension Lamb and Brown Rice dry dog food formula is specially prepared with all-natural ingredients for the complete health of your dog. With New Zealand free range deboned Lamb as our #1 ingredient, you can be assured that this food provides a wholesome and pure diet all with a great taste dogs love. Additionally, this hypoallergenic formula can help eliminate pet food allergies while ingredients like nutritious brown rice and sunflower oil provide efficient sources of energy that support exercise and endurance. Such nutrient-rich, whole foods help to fulfill the unique health needs of your dog, something you can feel good about. As with all of our Health Extension foods, we guarantee excellent nutrient digestibility through our patented digestive tract system, which includes blue green algae, prebiotics and |probiotics along with wholesome grains and natural fiber to help maintain a healthy intestinal tract. 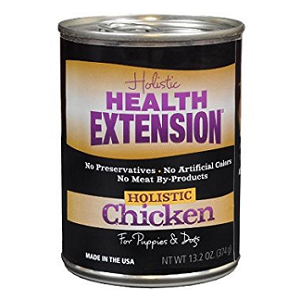 Holistic Health Extension Original Dog Food formula offers your pet the ultimate completely balanced diet containing highly digestible meat proteins. Our unique blend of nutritional supplements separates Health Extension from other super premium dog foods. Offering your pet this superior blend will proactively provide your dog the benefits of a healthier life. 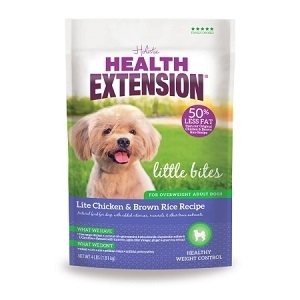 At last, a Holistic Little Bite Health Extension dog food with Longevity Drops specifically created for the teacup, toy and miniature breed puppy and adult dog. Designed with the total health of these dogs in mind, direct benefits of antioxidants are observed in its hypoallergenic qualities as well as its anti-hypoglycemic formulation. Little Bites is available in convenient size packaging that’s just right for you and your pet.